For encoding a latent image, the background is divided to zones with different micropatterns. On copying, inevitable changes of the micropattern take place. It is required to ensure a different character of such changes that will result toning of the latent image. Simple figures, such as a circle, change their form less than complex ones, such as a star or a thin line. So, one of the zones should be filled with round points. The lineature of the raster with the points should ensure at least a partial reproduction of the raster by the simplest copying machine, such as a fax machine. The second zone, on the contrary, should be filled with thin and intercrossed lines. A thin line is a figure with the largest perimeter/area ratio. The intersections of thin lines cause concentration of ink in the formed angles. The other important effect is moiré effect. Using the zero angle of rasterizing is not recommended because of a probability of appearance of moiré; however, a probability of appearance of such moiré on a copy is higher, so using the zero angle of rasterizing is reasonable. In various copying devices, other angles causing an appearance of moiré are disclosed as well. If vectors of a printed pattern are curved into an arc for 180 degrees, this imperfection may appear in some sectors of the arc. To ensure the maximum protective effect, the thickness of the thin lines should conform to the limits of the technical capabilities of the printing equipment. The thickness of the thin lines of documents printed by offset equipment usually is 0.05 mm. 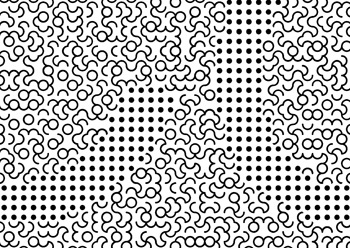 A background generated by the program included a unique pattern. Each square inch of the background with the pattern includes 8000 elements and each element is turned in one of four directions. The probability of an accidental coincidence of 5x5 cm fragments is 1/100000. For examination of genuineness, a magnifying glass or a contact microscope is sufficient. The pattern of the specimen and the one of the original standard shall be compared in several chosen points. Carrying out the comparison is most convenient in corners or close to images of other objects. If an experienced counterfeiter is aware of this circumstance, he may repeat a part of the pattern in such points manually. So, striving for a reliable examination, a random section, for example, in the distance of two centimeters from the top and three centimeters from the left, should be chosen. To ensure a higher level of protection, a document should be printed in two colours or more. 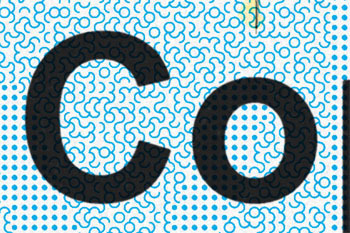 For example, print the unique pattern with a latent image in blue colour and the text over it - in black colour (overprint). A counterfeiter will not be able to get the pattern under the black letters. If on subsequent printings, the pattern will not be placed under the black letters, gaps (to be controlled under magnifying) will appear at the letters. Professional fake. A - gap, B - changed texture.